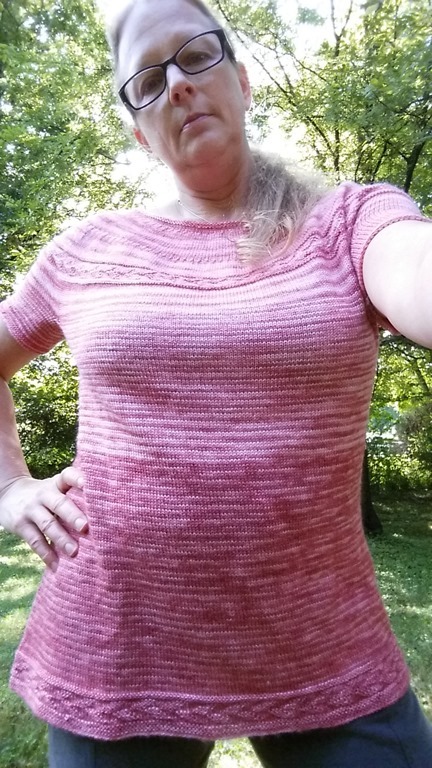 It took a few days to get caught up as always when I returned from 12 days on the road but I am finally ready to show you some pictures of the ladies size Sorrel top. Oh and yeah, what are your thoughts on the idea of changing the name for the larger sized version? Sorrel II? maybe I should name it for Lillah, my third granddaughter? Or what about Heather? (my daughter and Sorrel’s mom). Something else? Help! I am terrible at names, LOL! At first, before I blocked it, I tried it on and was unsure if I even liked it. I remained hopeful though since you should never judge a hand knit before a proper wet block. I was definitely not disappointed either. 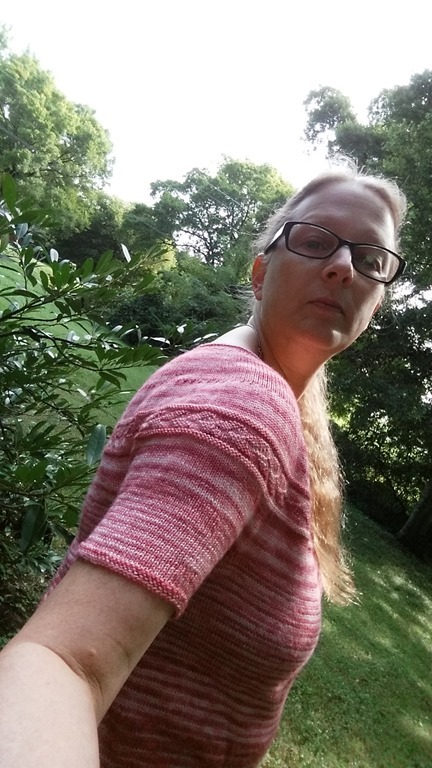 I am very pleased with the fit now and boy does this yarn feel great to wear. I am still wearing it while I am writing this post. :-) It is so soft and silky and light. Before I blocked it the measurement was small for the expected size but it easily blocked out to size without any excessive stretching. I didn’t even use any pins or wires. I simply put it in the washing machine for a hand wash cycle and laid it flat to dry on my bed. Only took about 6-8 hours to dry too. 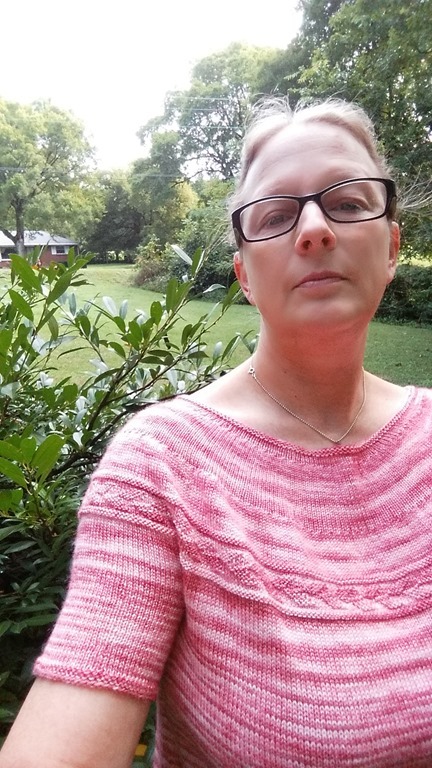 I am glad I lowered the neckline too. I was dubious even as I was binding it off that I had chosen right, but I am pleased with it. So, I guess I had better get busy finalizing the pattern draft. I haven’t done a thing with it yet as I have tons of admin tasks to do also right now in addition to the household tasks. Soon though, promise. You will hear it here as soon as it is ready. 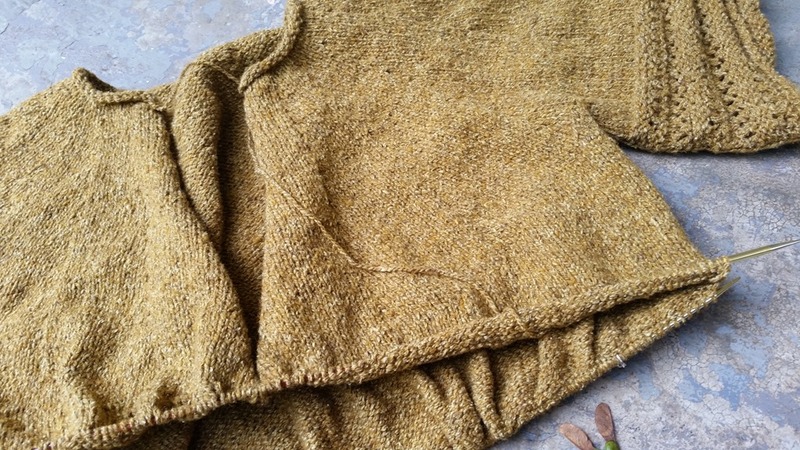 In other news, I am up to the second set of short rows on the body of my Chance of Showers cardigan. Also I have successfully upgraded the old laptop, which I am still using right now since the new one is still at least a week away from arriving, and it is going pretty good so far. I have noticed a few quirks with the touchpad, probably a driver, but I like it overall. Okay I will sign off for now. Talk to you again soon!